New in ProofHub: Now hide tabs in project section with just a tick! While creating a role in your projects, were you always bothered about giving away more than what was required? Let’s say, you created a Custom role for your clients. 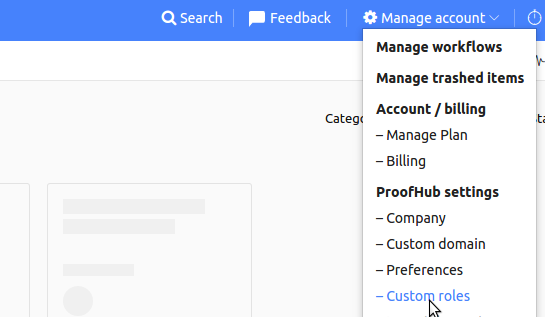 When they login to their ProofHub account, they’d be able to go to each tab/section of the projects because there was no way for you to keep them away from specific areas. This could lead to giving them insights of the internal discussions, or the ability to see each individual’s timesheets, or the tasks that are meant for the teams only, etc. To solve this, we are introducing the ability to choose if people with specific roles should or should not be able to see and access specific tabs/sections while managing custom roles. Click on ‘Manage account’. Select ‘Custom roles’ from the drop-down menu. Create a new Custom role or select from the ones you’ve already created (Other than the ones provided by default). It can be a new client role, a stakeholder role, a partner role or any other role you need. Once done, with each tab/section you will see the ‘Allow access’ check option. You can uncheck it to hide the section completely for people with this role. We hope this new option will help you better manage your projects and keep things private and secure. Do share your thoughts in the comments section below and we’ll also appreciate your suggestions to make it even better. Also, do check out the other ProofHub updates and what’s coming next. We’re glad to know that it will help in your work. Keep checking our updates page for more. If we hide the Files tab, are files still be accessible from tasks as attachments? If any file is attached to a task, then it will be accessible. The main idea is to restrict the user from the files that are directly uploaded into the ‘Files’ tab.